If you don’t believe in small things, you should have a look at this small equipment, who has changed the face of power system and the electronic industry, and that revolutionary equipment is known as “Relay”. This revolutionary relay is mainly used as a switching device in electronic industry, as well as in electrical industry. There are several kinds of relay available in the market, but to start with we are going to focus on an ELECTROMAGNETIC RELAY in this article, which is the base of all relay. So, if you understand the basics first, rest of the things are going to get easy. This article will help you to understand the basic construction and the working of an electromagnetic relay. Any system is kind of like unpredictable. How, when and where a fault or an unwanted activity will occur is a question unanswered. Though we can’t prevent completely a fault or sudden disturbance happening, we surely can protect our system from the unwanted behaviour and the most important part played is by the soldier named as a ‘RELAY’. A relay is an electrically operated switch. They open or close a circuit as and when required. A conventional relay is basically an electromagnet operated by a relatively small electric current that can turn on or off a much larger electric current of our power system. Thus, the heart of a relay is an electromagnet (a coil that gets temporarily magnetised when a small amount of current flows through it). It consists of a coil wounded over a soft iron core which forms an electromagnet. 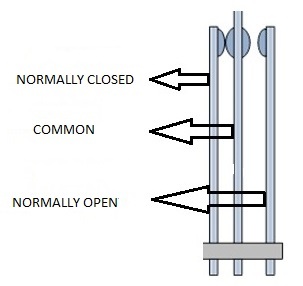 There are contacts named normally open (NO) (whose default position is open), normally closed (NC) (whose default position is close) and a common contact, thus forming a double throw single pole switch. This common contact has the power, yes, if the common contact is on NC contact, current flows through NC, and if common contact is on NO contact, current flows through that. Under normal operating conditions, the common contact or the pole is resting on the NC contact, or you can say, common contact’s default position is on NC contact. The NC and NO are fixed while the common is a moving contact. All the contacts are held in their place with the help of a control spring which prevents mal-operation of the device. 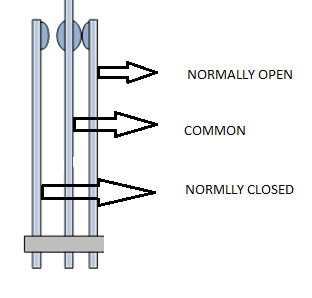 A pivot is provided which carries out the necessary opening and closing of the relay. An air gap is provided in between the pivot and the electromagnet to keep the contacts in place when the relay is de-energised. To understand the working of relay, consider the application of relay in power system. Under normal operating conditions when the system current is in limits, the relay will remain inoperative. By relay being inoperative we mean that the electromagnet or the coil is weak to produce a strong attractive force on the pivot to make/break the contacts. In inoperative state the contacts of the relay are as shown in fig 3(a) and the relay circuit looks like as one shown in fig 1(the contacts and the armature not connected to each other). Fig.3 Switch positions of relay. When there is any problem or any disturbance occurring, the parameters change (say, current flowing may become very high). This change is seen by the relay as the excess current flows through the coil. The excess of current is enough to produce an extremely strong magnetic field. This magnetic field attracts the pivot and it moves. The movement of the pivot changes the switch position of NO from NO (normally open) to NC (normally close) and relay operates. The operation of relay is nothing but the connection of it to the circuit breaker – a device that actually makes and breaks the circuit. This operation of relay sends a current to the trip coil of Circuit Breaker, which isolates the further part of system keeping it safe. To wrap up the working of a simple electromagnetic relay we can say that, when the coil of relay gets supply it creates its own magnetic field, this field attracts the common contact from its default position to its new position. And now you’re NO contact is closed and NC contact is open. The relay will hold this position, until the coil is getting supply, once the supply will cut the common contact will get back to its default position, which will make NC contact close again. So, this is how a simple electromagnetic relay works…! That’s all for now, We’ll see you guys in next article. If the article helped you please share it. You can find us on YouTube, Facebook, Instagram, google + to receive the next update.